How Do Trees Get Through Winter? Trees don’t often freeze to death because they have certain processes “built-in” on a cellular level that prevents this. During the winter, we often have to bring many of our garden plants indoors, or just let them freeze. But what do we do about trees? They won’t exactly fit into most homes, and their vast root systems make them immovable. Fortunately, your trees know how to protect themselves! 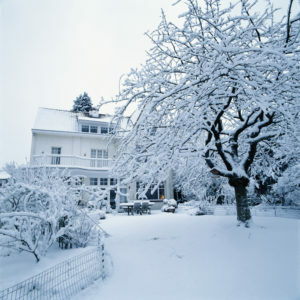 Most trees freeze when temperatures are around 20 to 30 degrees Fahrenheit. The exact temperature varies based on the tree’s size, age, species, and many other factors. If you live in a particularly cold climate, temperatures may get well below 20 to 30 and stay there for a while. Don’t worry, though! As long as the trees manage to keep their living cells from freezing they’re okay. Trees don’t often freeze to death because they have certain processes “built-in” on a cellular level that prevents this. Like many animals, trees also go into hibernation in the winter. It’s just called dormancy. When trees are preparing for dormancy, they start by dropping their leaves. Leaves require water to support them, so the trees are basically relieving themselves of “non-essential personnel”. Without leaves, the trees can use the little water they do get to keep the roots, trunk, and branches alive. Since trees are about 50% water, that water freezes in the winter. The water in the outer layers of the tree bark actually acts as an insulator that keeps the cells on the inside alive through frigid temperatures. Trees also have the unique ability to convert the starch in their cells to sugar, which helps them stand up to cold better. The reason that evergreen trees don’t shed needles for winter like other trees shed their leaves is simply because they don’t need to. Pine needles require far less water to stay healthy. Even when the weather is icy and freezing, pine trees have the unique ability to move moisture throughout their own branches in order to stay nourished. Evergreen trees actually require very little water to stay healthy. This entry was posted on Wednesday, February 14th, 2018 at 12:35 pm. Both comments and pings are currently closed.